Brilliant! 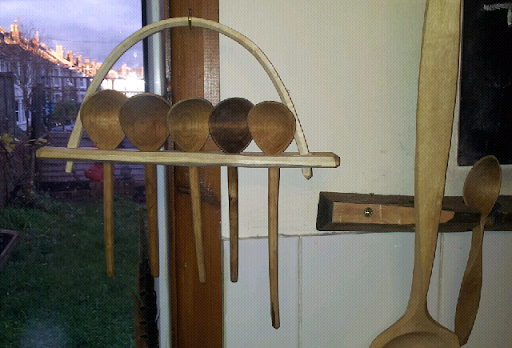 finally got round to making one of these, my large spoon rack was over flowing with all my spoons and some even had to live in a draw! Those of you that are spoon enthused will have seen antique ones of these and i have seen Wayne Batchelor of the APT with his -which i think had the loop made from hazel in the round. It works perfectly with my octagonal handled eating spoons. I don't have any whippy bits of hazel at the moment so i made this with cleft hazel, I barely skimmed the bark off the outside of the loop and steam bent it to shape (it wouldn't bend without the heat), this has been a thoroughly enjoyable experience reminds me of steam bending days in the woods for chair making except instead of using an open fire and oil drum i was using a roasting pan on a gas hob. In fact i enjoyed it so much i have just made another 2 in Wych Elm with similar hazel hoop, they each hold 6 hazel eating spoons and one could be yours for £60 spoons and all. These two racks have sold now, but i'de be interested in doing some more if anyone wants one get in contact.